So much for the coalition government. At least 80 people are dead in two days of fighting. 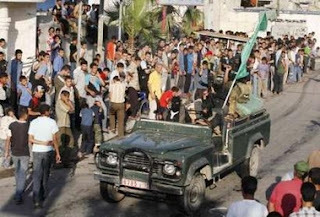 Hamas pounded Gaza City’s three main security compounds with mortars, grenades and assault rifles Wednesday, calling on beleaguered Fatah forces to surrender in an apparent attempt to take control of the entire Gaza Strip. 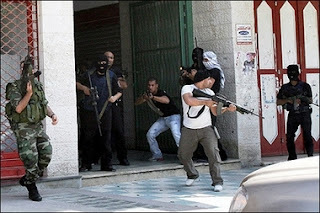 In one dramatic victory, hundreds of members of a Fatah-allied clan that had fought fiercely surrendered to masked Hamas gunmen. They were led — arms raised in the air — to a nearby mosque. 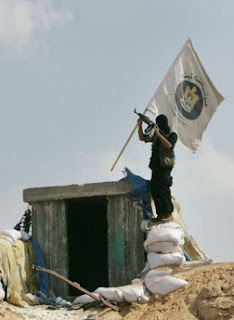 Fatah fighters desperately tried to cling to their positions, but appeared outgunned by Hamas. One of the battles raged around the headquarters of the Fatah-allied Preventive Security, with both sides firing wildly from high-rise rooftops. The media says this could lead to all-out civil war?? 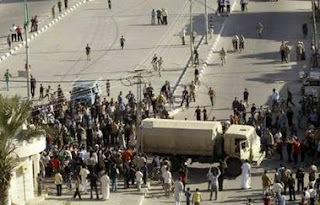 Snapped Shot is demanding Hamas remove all of its occupying force.